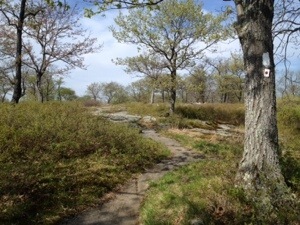 William Brian Memorial Shelter, N.Y., AT NOBO mile 1389.6, Wednesday May 15, 2014 — It’s official, less than 800 miles to go! Seems like I was just celebrating the completion of the first 800 miles. Miles fly when you’re having fun. Today was a hard day. 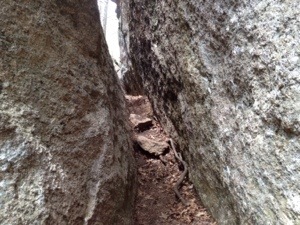 Since crossing the New Jersey border the rock scrambling has grown more intense. 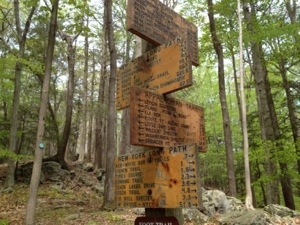 A fitting trail marker that looks like a Japanese flag turned up in Harriman State Park. I can’t imagine a better fit with the hand-over-hand climbing we’ve been doing. Tomorrow and Friday it’s going to rain. 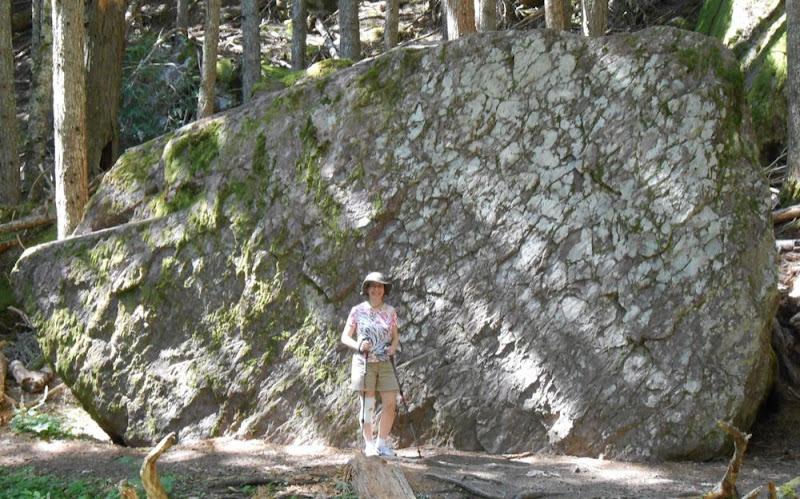 The rocks are especially slippery when wet. I think the worst of them are behind us, but we’re a bit concerned safety wise. The going will be very slow if today’s terrain is any measure. 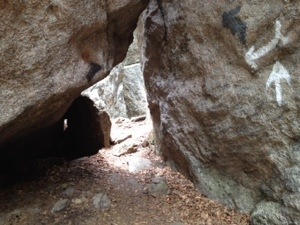 Today’s tasty morsels included the “Lemon Squeezer” which is a very narrow rock passage, and some trail side magic, the first I’ve encountered. 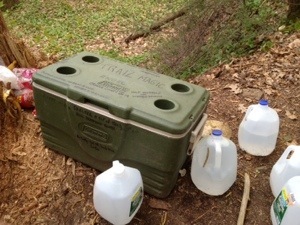 The cooler had fresh fruit and cookies. The water was extra welcome on what was a hot day. 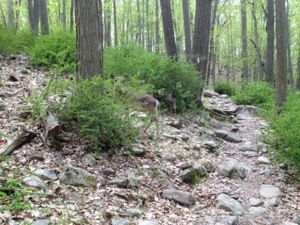 The deer in Harriman Park seem about as tame as those in Shenandoah. I was almost able to pat a young doe on the rump this afternoon. Last night we were paid a special visit from a hiking club from Indiana. They arrived long after hiker midnight, headlamps blazing and announcing their presence with hoots and hollers. These are gray- haired types though it appears they were unaware of AT protocol. At first they seemed to think they were going to pile into the shelter, at least until they realized was full. So, they tented. We asked their shuttle driver, whom we met at a trailhead this morning, to help educate them on how to behave after dark. A little courtesy goes a long way out here. The grey-haired types from IN ought to know better. Very rude of them. I hope you don’t encounter them again. 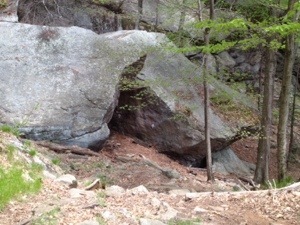 That’s a big boulder. We’ve been scrambling in and around them for the past three days. Not at all expected. 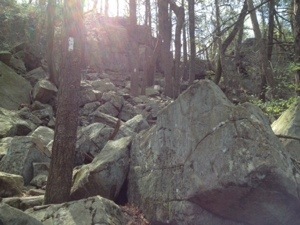 Nobody seems to take much note of NY except the sorry little zoo at Bear Mountain where we are now.